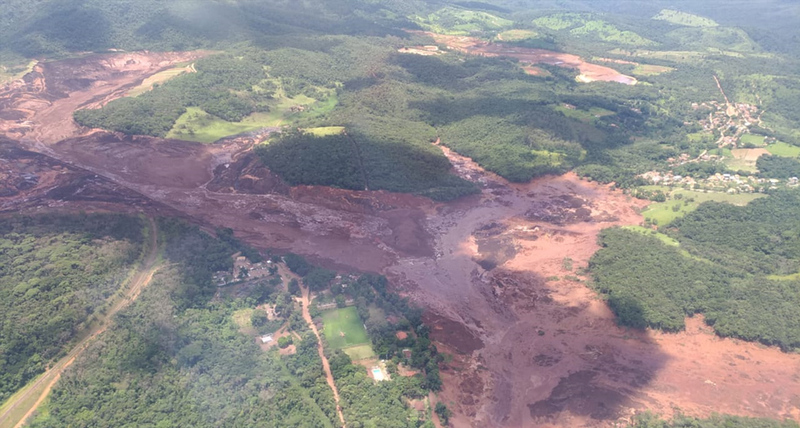 At least 37 people have been killed and more than 250 others are feared dead in Friday’s disaster at an iron ore mine near the town of Brumadinho. 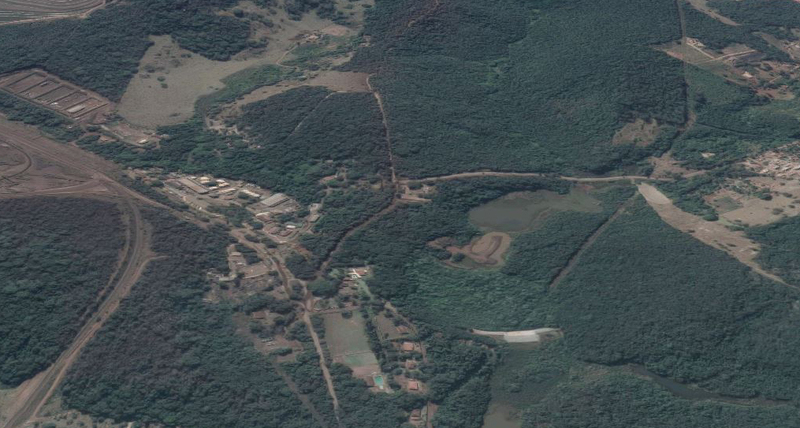 Both dams at the mining complex belong to Vale, Brazil’s largest mining firm. On Sunday, warning sirens rang out at 5:30 local time (7:30 GMT) over Brumadinho, which is home to some 39,000 people. All the town’s bridges were ordered to close, while residents rushed to higher ground. “With bags on their backs, everything they could grab, children, old people climbing up, it was total despair,” one man told the BBC. The rupture on Friday occurred at one of Vale’s iron-ore “tailings” dams, which are typically used to hold mining waste. The incident caused a sea of muddy sludge to bury the site’s cafeteria, where workers were eating lunch, and at least one bus that carried employees, before engulfing buildings, vehicles and roads. On Saturday, emergency services used helicopters and earth-moving machinery in the search for survivors. What is the latest in the searches? Rescue efforts were suspended early on Sunday over fears of the second dam bursting but resumed by the middle of the afternoon. Some 366 people have been rescued, Minas Gerais state fire department says. Of those, 23 have been taken to hospital. Vale said it could not reach 252 of its employees and contractors. Residents and guests at an inn were also reported missing. Eight of the victims have been identified. Search efforts have been hampered by the difficult access to the area, the BBC’s Julia Carneiro in Brumadinho reports. Even retrieving the bodies will be complicated because they are thought to be under a thick layer of mud, our correspondent adds. A bus that was carrying workers was found but it was unclear how many people were inside. Three people who were stranded in a pick-up truck were rescued alive. President Jair Bolsonaro, who flew over the disaster area in a helicopter on Saturday, tweeted that it was hard not to get “emotional” after seeing the scale of the devastation. He said he had accepted an offer by Israel to send search equipment that could find people buried in the mud. State prosecutors announced on Sunday they had frozen a total of 11bn reais ($2.9bn; £2.2bn) of Vale’s assets. A judge had earlier frozen 6bn reais from its accounts to help fund recovery works and handle damages. Relatives of the missing gathered at a warehouse set up by Vale criticised the lack of information. “I want to know the truth. There’s a disregard for everyone here,” 43-year-old Sirlene do Carmo Januário told the BBC – her missing 23-year-old son, Rangel, worked at a company’s building that was hit by the sludge. The collapse comes just over three years since a dam burst in Mariana, also in Minas Gerais, killing 19 people, in what was considered Brazil’s worst environmental disaster. What do we know about the collapse? 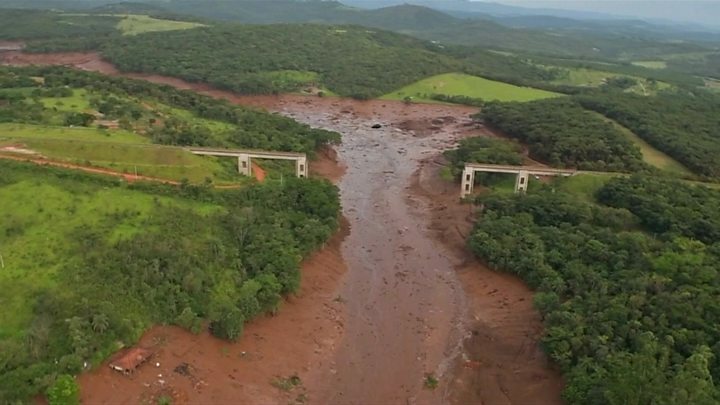 The dam near Feijão iron ore mine burst its barrier at around 13:00 local time (15:00 GMT) on Friday, flooding another dam down below. The torrent of sludge cut through the dam’s complex, nearby farms and the neighbourhood where many of the workers lived, destroying houses and vehicles. There are reports that the dam’s alarm system – which local residents had been trained to respond to – failed at the time of the accident. Vale president Fabio Schvartsman said the accident may have occurred too quickly for a siren which triggers security protocols to be activated. Built in 1976, the dam was one of several in the area and it was used to hold residue from the mine. It had a capacity of 12m cubic metres and had been an inactive site for three years, Vale said. On 5 November 2015, a dam – also owned by Vale, along with BHP Billiton – burst at a Samarco mine in Mariana. More than 60m cubic metres – enough to fill 20,000 Olympic swimming pools – spilled over into the surrounding area. After a lengthy court case, BHP Billiton and Vale reached a settlement worth at least 6.8bn reais ($1.8bn) with the Brazilian government. Have you been affected by the collapsed dam? If it is safe to do so please share your experiences by emailing haveyoursay@bbc.co.uk.